Time flies when you're having fun. It is already the second week of the session, and the summer is starting to find its groove. Today is our second cruiser day of the summer. 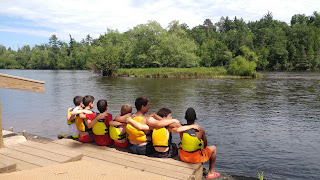 Junior and Intermediate Village campers spent the day participating in activities such as tubing, slip n' sliding, and potentially a trip to a resort across the lake. Cruiser day is camp's "weekend", a break from our typical routine. 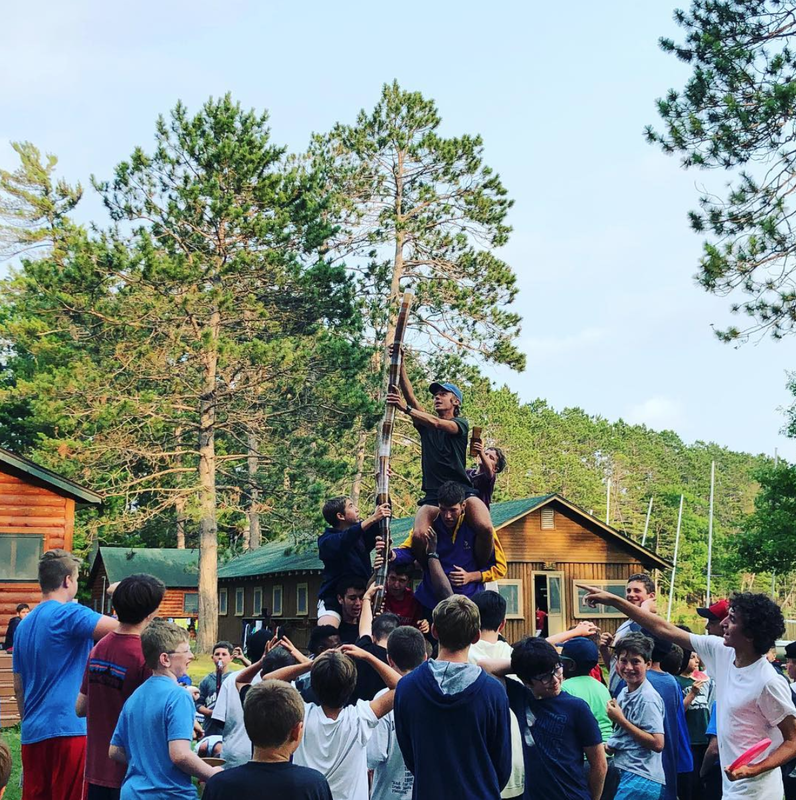 Cabins spend the day together, partaking in activities planned by their counselors. Senior Village campers enjoyed the first day of College Days, a three-day event in which the campers are split into 4 teams and face off in a variety of events. College Days officially kicked off Monday night, as the village watched Rudy for some inspiration before a few days of friendly competition. After the movie, the campers were divided into their four teams before choosing the colleges they will represent for the next few days. The 2018 College Days teams are the Central Arkansas Bears, the Colorado School of Mines Orediggers, the Defiance Yellow Jackets, and the Notre Dame Fighting Irish. Notre Dame, taking some inspiration from Rudy, came back dramatically from a 6 run deficit in their first round softball game. They would go on to win the softball event. 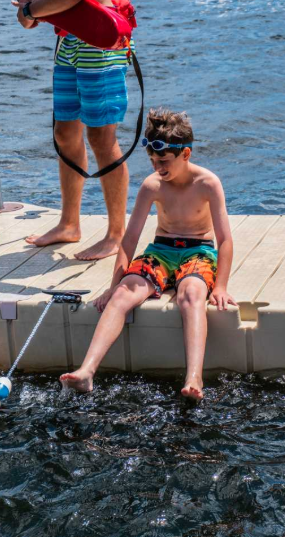 While the schedule on cruiser day is different than others, campers have gotten to experience a variety of unique events and special programs during the session. On Wednesday evening, campers and staff played a game of glow in the dark ultimate frisbee, with a glowing frisbee and each player wearing multiple glow sticks. At Saturday's dinner picnic, a group of staff members and campers decided to see how tall they could stack their cups, ending with an astounding 101 cups stacked on top of each other! This inspired a cup stacking session in the next day's Wacky One Day activity. Also featured in Sunday's Wacky One Day period was Sumo Wrestling, a juggling class, and a seminar on how to change a tire. 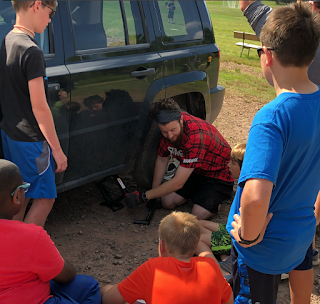 Campers were given a comprehensive lesson in this important life skill, starting with where to find the manual, and then watching a demonstration on how to change a tire, step by step. Initially attended primarily by our younger boys, a crowd of older campers joined once they saw just how educational the session was. 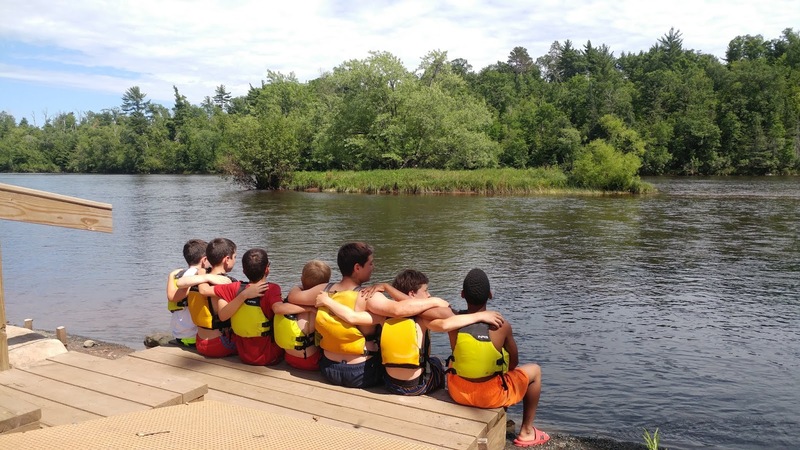 On Sunday the Pine Manor campers went out of camp to attend an Ojibwa Tribe Pow Wow. They were able to see a dancing competition and traditional drumming, as well as a singing group from Canada. The performers were dressed in traditional outfits, and the local tribal leader spoke to the audience in both english and a native language. 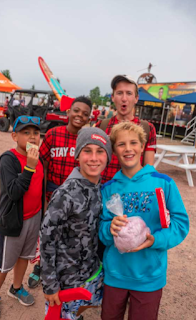 There were a variety of vendors present, with offerings ranging from a map of tribal lands across North and South America, to a man selling indigenous LaCrosse sticks. The wood was steam bent, and the vendor showed campers how to cradle a ball with his special one-handed sticks. The upcoming week promises to be just as fun. The Senior Village still has a few days of College Days remaining, including highlights such as plaque making and the Cook-Out. The rest of camp will participate in their second round of activity sign-ups. Chairs up! This past Sunday, we welcomed our 2nd session campers from Chicago and the Minneapolis airport as they ran up the hill through a man-made tunnel of cheering 8-week campers and staff. There, everyone gathered around the flagpole where cabins were announced for this session and new friends were happily made. 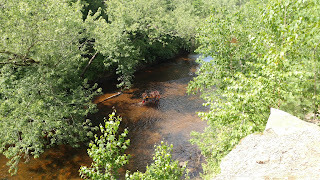 The next day, we proceeded with swim tests, health checks, and village activities. While some were swimming laps or getting their temperature taken, others played dodgeball or paddle boarded. Because the campers who are staying for 8 weeks completed these checks last session, they spent their day at the beach on Lake Superior. For dinner, staff dressed up in costumes and cheered as campers entered the lodge for our banquet, enjoying pasta, Caesar salad, and dirt and worms for dessert (chocolate and gummy worms!!). We had our first full day of programs on Tuesday. Returners enjoyed programs like climbing or archery they had been dreaming about doing all year, while first time campers got to try waterskiing or sailing for the very first time. In the evening, everyone headed to the Council Ring to see the Staff Show, hosted by our very Nick Farley and Jared Gillett! 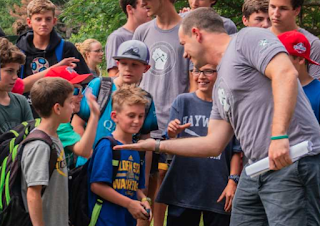 Groups of staff were called up to create their own answers to fill-in-the-blank answers and introduced themselves to the campers. Thursday was our very first Cruiser Day of the session. While we usually have them on Tuesdays, this reason was for a special occasion. It was the day we surprised everyone and went the Lumberjack World Championship! 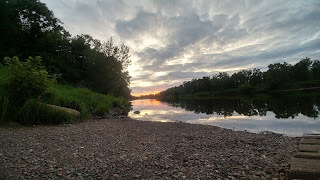 The Junior Village went to the KOA Campground in Hayward, WI and met up with the rest of the camp there. While some watched lumberjacks chop wood and run across logs, others tried their hand at hitting the bell with a mallet and winning the glorious "Stay Giant™" t-shirt. Yesterday was our first Friday Night Service of the session, the theme being teamwork. Even though rain was expected and the air blew on the chilly side, that didn't stop North Star. We had our Keylog Ceremony, which gives campers and staff the opportunity thank those that had helped them. Guitars were played, songs were sung, keylogs were thrown, and an excellent sermonette was given by Jonah Goldfine. And with a fantastic first week, we look forward to the next one!